Note: This product is a bundle. By ordering one of these you will receive two cage kits. 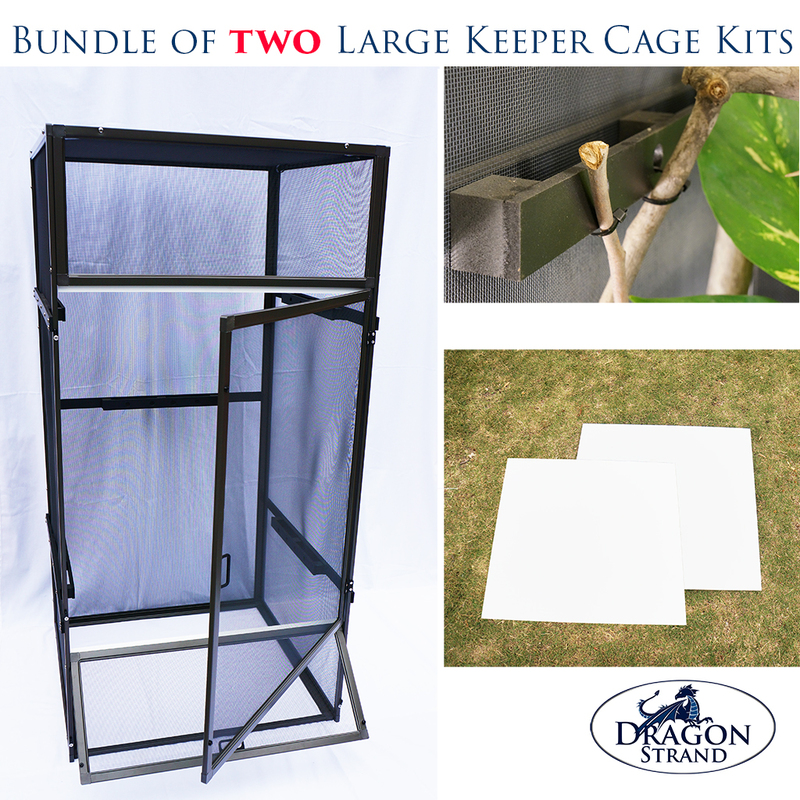 The Large Keeper Kit gives you a Large Keeper Screen Cage, a five set of Dragon Ledges, and an extra floor panel. 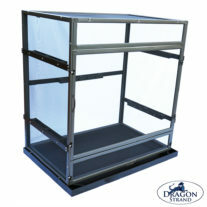 Large Keeper Screen Cage: 23.75” wide x 23” deep x 48” high. This cage is suitable for most chameleon species through their entire life including Panther Chameleons, Veiled Chameleons, and Jackson’s Chameleons. This is an all screen cage made of rust proof components so it may be used indoors, outdoors, and in greenhouses. 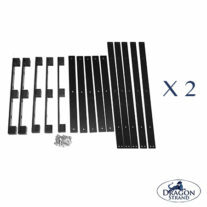 Dragon Ledges: These patent pending interior supports provide the strength to install horizontal branches and potted plants on the sides of the cage without stressing the screen. These Ledges are what allows you to create beautiful vertical plant displays. Extra Floor Panel: A simple, but highly effective cleanliness maintenance tool. With an extra floor panel your cleaning regimen is a simple removal of the soiled floor panel and an immediate replacement with a clean floor panel. 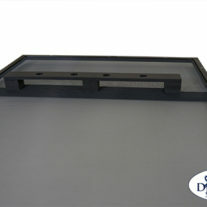 The soiled panel can then be deep cleaned without the worry of your chameleon having access to the drainage tray water. Spot cleaning just gets “most” of the poop, bacteria, and parasites. But what remains is still enough to cause problems. Replacing spot cleaning with deep cleaning takes your husbandry up a notch and this helps you do it. The Large Keeper Kit was designed to give you the structure you need to build up a beautiful chameleon cage and to help maintain the health of your chameleon. 23.75” wide, 23” deep, 48” high – Size is suitable for adult male Panther, Veiled, and Jackson’s Chameleons. rust proof components – Allows this cage to be used outdoors without the danger of parts rusting about the time your plant landscape is mature and looking great. Service Door – A flip-up door on the bottom of the cage that allows you to spot-clean the floor or remove the floor panel for a deep cleaning with the minimum of disturbing your chameleon. Door handles on main and service door – if you are used to Dragon Strand cages you probably don’t know why this very basic necessity is listed as a feature. Good for you. People who have had other cages where they had to jam their finger between panels to open a door will know why this can be listed as a feature in today’s market. 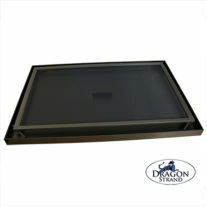 Dragon Ledges: You get five Dragon Ledges that may be installed on either side or back of the cage. These ledges provide the foundation for you to let loose with your landscaping imagination to create an environment as beautiful as your chameleon! Extra Floor Panel: I am including an extra floor panel to promote an increase in hygiene for our chameleon keeping. Currently, the common method is to spot clean the floor. That means picking up the chameleon poop with a paper towel and calling it good. Unfortunately, that does not take care of all the bacteria, viruses, and parasites. For those items a deep clean is necessary. That, though, takes a bit of time and you don’t want to leave the bottom of your cage open. By having an extra floor panel you can pulled the soiled one out and immediately replace it with a clean one. You can then wash the soiled one thoroughly at your leisure. The first step to a healthier chameleon is having the tools necessary. Note that this strategy requires that there be no plants on the bottom of the cage. That is what the Dragon Ledges are for! Placing the plants on the side walls of the cage is more than just an aesthetic move. Keeping the bottom clear is a hygienic move!